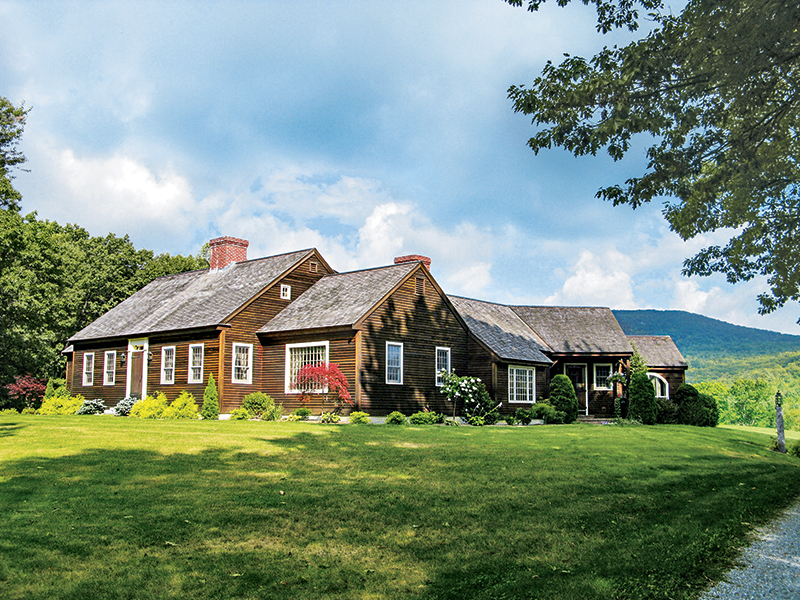 Learn from two small New England farms that are the standard-bearers for doing it as nature intended. 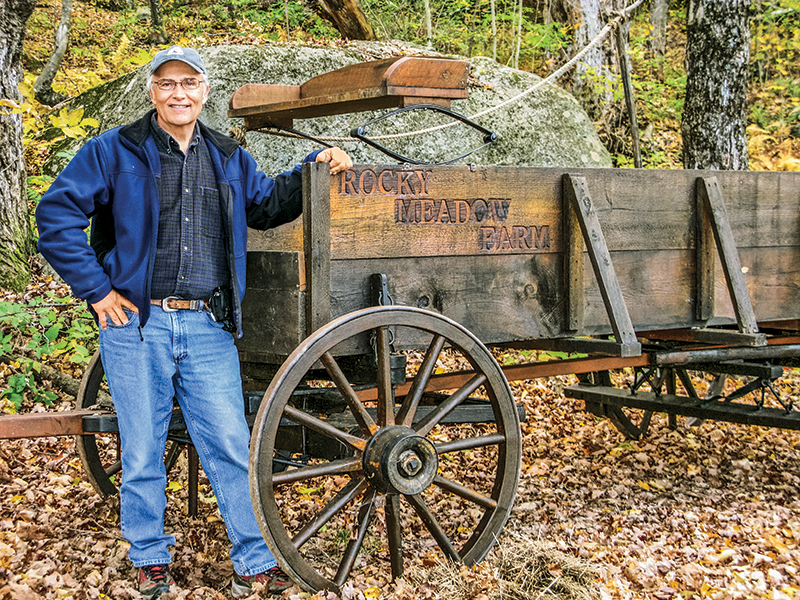 Wayne LeClair stands next to a wagon used at Rocky Meadow Farm. When he bought the place, the land had been reclaimed by forest. 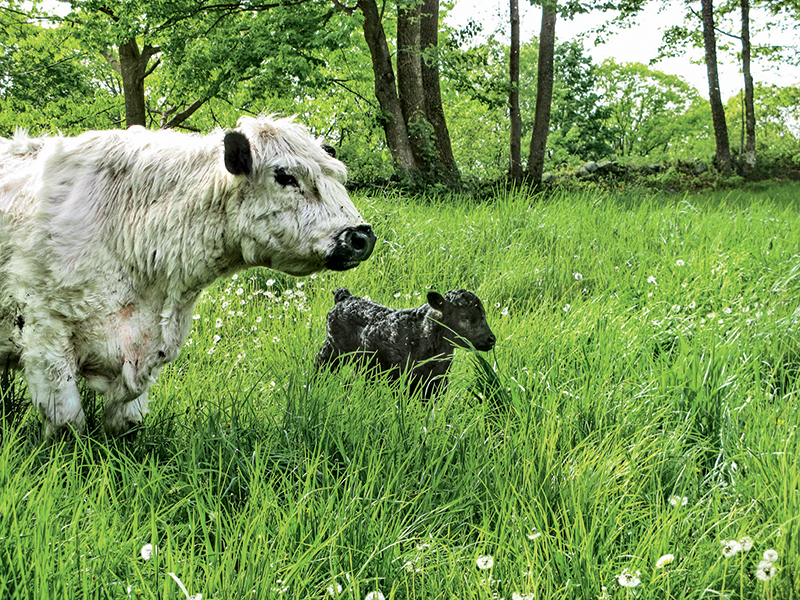 A Galloway cow and calf at Rocky Meadow Farm. The Galloway is a heritage breed that originated in Scotland and will take cold weather. White Galloways and a brown one grazing on the nutritious grass at Rocky Meadow Farm. The cattle are grass-fed and grass-finished. Wayne LeClair’s tractor and baleage (round bale silage) on one of his fields. The bales will be wrapped in white plastic, where they will ferment and be used for winter feed. Dr. Wayne LeClair truly is a jack of all trades. When he puts his mind to something, things get done and done right. Look for a future story about how Wayne designed and built his home. Brian and Kiera Farmer, owners of Yankee Farmer’s Market, which they started over 20 years ago to put agriculture back in the hands of the small, local farmer. The owners of Yankee Farmer’s Market want to make people aware of bison as a low-fat, low-cholesterol, tasty source of meat. The inside of Yankee Farmer’s Market. 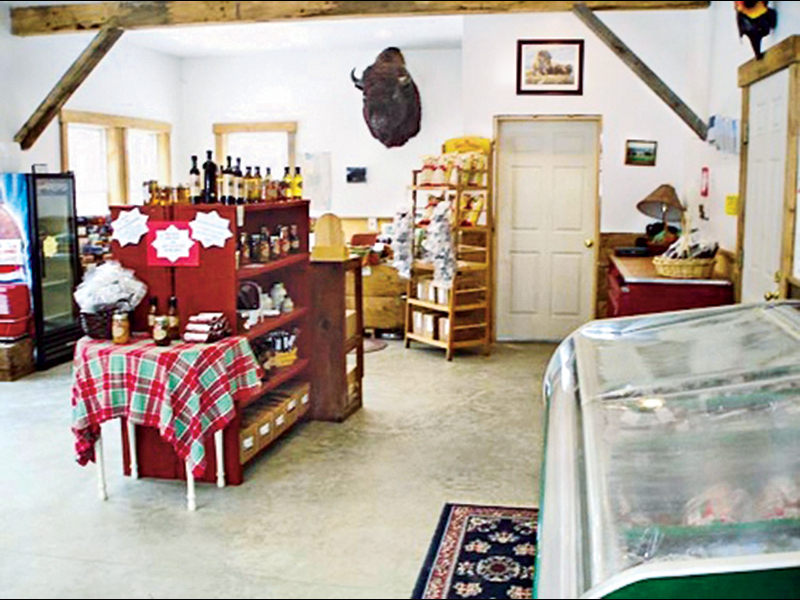 Locally raised and produced items, such as honey, jellies and jams, soap, dips, venison and elk, are some of the products sold. Long before the early European colonists brought livestock to New England, the native people of the area sustained themselves by eating the food that nature provided, with their meat coming from deer, moose, bear and small game. Journals kept by the European settlers note how remarkably healthy the native population was. It is also recorded that the overall health of the colonists improved once they arrived in what was then called the New World. Why was this the case? A great deal of research has been done over the years studying how diet affects overall human health. 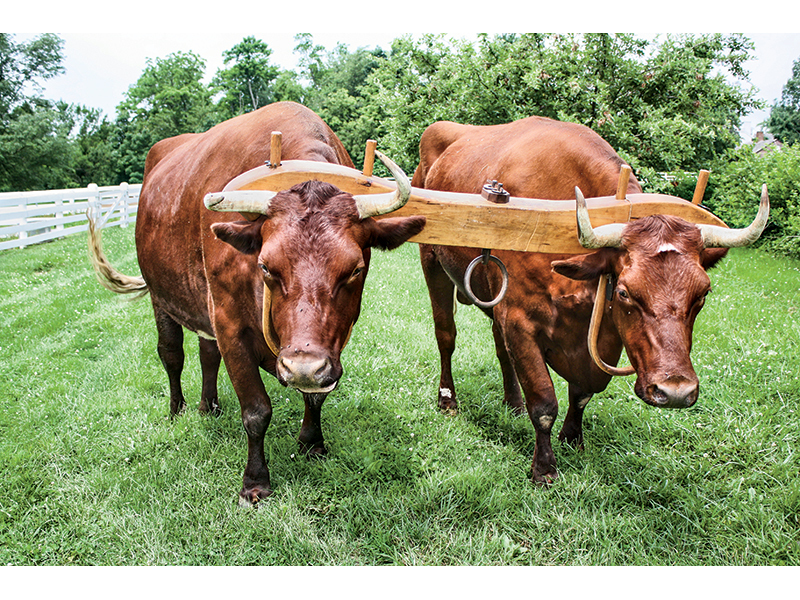 The early colonists didn’t fill their livestock full of antibiotics and growth hormones. The cattle were not “fattened up” on large commercial feed lots. In the early days, cattle and other livestock were allowed to roam the pastureland, eating grass and anything else that they could find. They spent their entire lives on this land. The meat produced from these animals was lower in fat and higher in the nutrients that we humans need to survive. If we fast-forward to today, sadly, raising cattle and other livestock has become a big business, with little to no regard being paid to either the animals or the human consumer. Being considered a commodity, the quicker the animals can be fattened, sent to slaughter and then to the supermarket, the quicker the monetary return to investors. Unfortunately, it is a sign of the times. It doesn’t have to be that way, however. 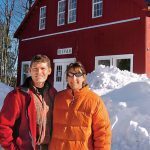 Here in New Hampshire, there are many small farms that are going back to the proven methods of the past. These farmers have gone back to using heritage breeds of livestock or even bison. The animals are not fed grain, shot full of antibiotics or growth hormones and are allowed to grow naturally, thus providing a healthy product. We’ll look at two of these farms. 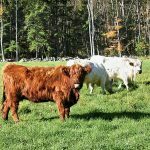 The Rocky Meadow Farm is in Francestown, New Hampshire, and raises grass-fed beef cattle while Yankee Farmer’s Market in Warner, New Hampshire, raises free-roaming bison. We often hear the term “heritage” when describing livestock. What exactly does that mean? Heritage breeds of livestock were used by farmers long before industrial agriculture became the norm. Many of these animals were bred, over time, to develop traits that would allow them to survive in specific environments. Some of those traits include better disease resistance, high fertility, longevity, and the ability to forage on different grasses. 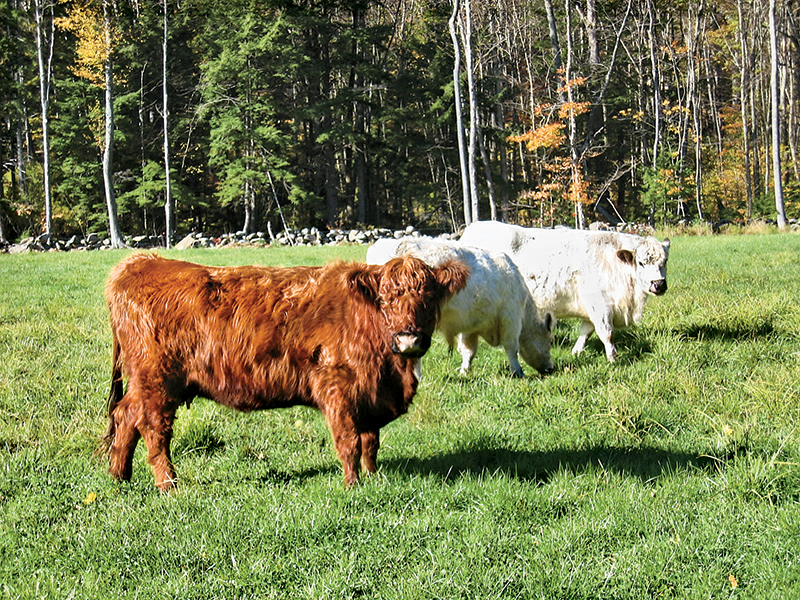 Here in New England two heritage breeds stand out: the Scottish Highland and the Galloway. Both are well adapted to cold, wet environments, and their ability to survive on rough forage makes them a perfect fit in the less-than-ideal conditions of New England. Both are long lived, are able to take care of themselves and are known to produce high-quality beef. While most of the heritage cattle breeds were purposely bred by humans, the Florida Cracker came about through natural selection. A direct descendant of cattle brought to Florida by the Spanish in the 1400s, these cattle developed the ability to survive in the harsh environment of tropical Florida. They are heat-tolerant, able to live on poor forage and are parasite- and disease-resistant. 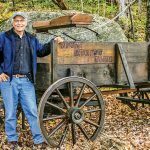 I had the opportunity to sit and speak with Dr. Wayne LeClair, the owner of Rocky Meadow Farm, in the comfort of his home. It was a cold winter day when we met up, and like every other time of the year, chores needed to be done before we had a chance to chat. I had arrived just after the cattle had been taken care of and Wayne was more than willing to tell me the story of Rocky Meadow Farm. “It all starts and ends with the land,” Wayne told me. 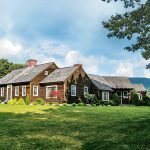 It seems that back as far as the 1930s, this property was part of a much larger farm called the Udall Farm, which grew, among other things, cucumbers that were sold to a large pickle company in Boston. Unable to keep things going, the owners ceased to operate a working farm in the mid-1940s, and this portion of the land was reclaimed by the surrounding forest. Over the years he learned that this was as much grass farming as it was cattle farming. As a physician, Wayne knows the value of a healthy diet to overall human health. With that in mind, he wanted the cattle that he raised to be as healthy as possible. That goal starts with the land. Wayne replanted the fields with the highest-quality, GMO-free grass seed he could find. 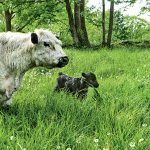 He chose to raise Galloway cattle, a rare heritage breed that originated in Scotland. These cattle have been found to do extremely well on a grass-only diet and adapt very well to the colder climates of northern North America, where the temperatures can range from being very cold in the winter to very hot in the summer. 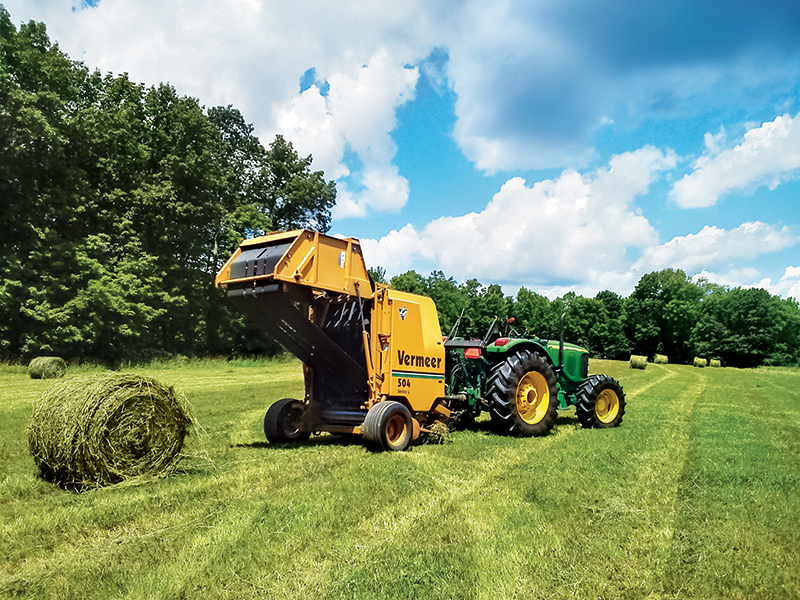 Out of the 270 acres, 50 acres have been cleared for both pasture and hay fields. Each grazing field has its own water supply and different types of cover. During the spring, when the grass is usually growing well, Wayne will rotate the cattle to a different field about every two days. In the summer, when the grass is not growing as well, he may have to rotate the cattle more often. 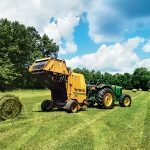 By only clearing the land for pasture as he needs it, Rocky Meadow Farm allows great biodiversity to exist, which makes for a healthy environment. Wayne told me that he has seen deer, bear, moose, turkey, bobcat and a host of other animals on the property. I can attest to that, because on the day I visited I had a flock of turkeys, numbering about 10 birds, blocking the road in front of me at one point. RELATED STORY: How Do We Define Heritage Birds? Wayne wanted to make one thing very clear to me. There is a big difference between being grass fed and being grass finished. Technically, all cattle can be considered grass fed as they all graze on grass at some point of their lives. Grass-finished cattle are those that eat only grass right up to the time they are slaughtered. Rocky Meadow Farm sells its product a couple of times a year. Averaging a herd that at any given time numbers 18 to 40 head, the cattle picked for slaughter are typically about two years of age. This is when they `naturally reach the ideal slaughter weight. Customers can order an entire head of cattle, half a head of cattle or even special cut packets. Many people team up with other buyers to split an entire head of beef, which works out to be very cost effective. Rocky Meadow Farm is just one of the many cattle farms out there that are trying to do things the right way. From our earliest days, the small local farmers have been the stewards of the land, producing good, healthy food that benefits us all. Last winter I also paid a visit to Yankee Farmer’s Market in Warner, New Hampshire. Even before I met the owners, Brian and Kiera Farmer, I was impressed with what I saw. There, behind the store, was a small herd of bison. I knew right then and there that I wanted to learn more. Brian was in the middle of chores, but he was more than willing to speak to me if I was willing to tag along. 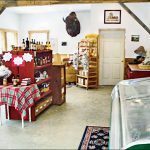 To help meet that goal, the store also sells products such as honey, jellies and jams, a variety of meat in addition to bison, and other items. To be sold in the store, the products need to be locally produced and meet the standards set by Brian and Kiera. Brian informed me that bison are naturally low in fat and low in cholesterol, which makes them a healthy alternative to some store-bought beef. The next logical question was “Why bison?” The answer was very simple. Unlike with some domestic cattle herds, bison are fully capable of taking care of themselves if given plenty of room to roam. That is why the herds are kept small and separated. With the exception of supplementing the animal’s winter browsing with hay and harvesting them, bison are very low maintenance. As far as the bison are concerned, there is no desire to mass-produce the animals. While such a practice would be more profitable, it is not what the Farmers stand for. Brian informed me that there are other bison farms out there that have fallen into the trap of biologically engineering their animals or leaving them in overcrowded, unhealthy and often inhumane conditions, thus turning the bison into a commodity. 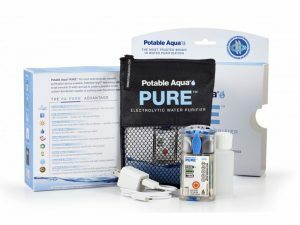 This makes getting a quick return on the dollar more of a priority than producing a quality product. Yankee Farmer’s Market will never go that route. 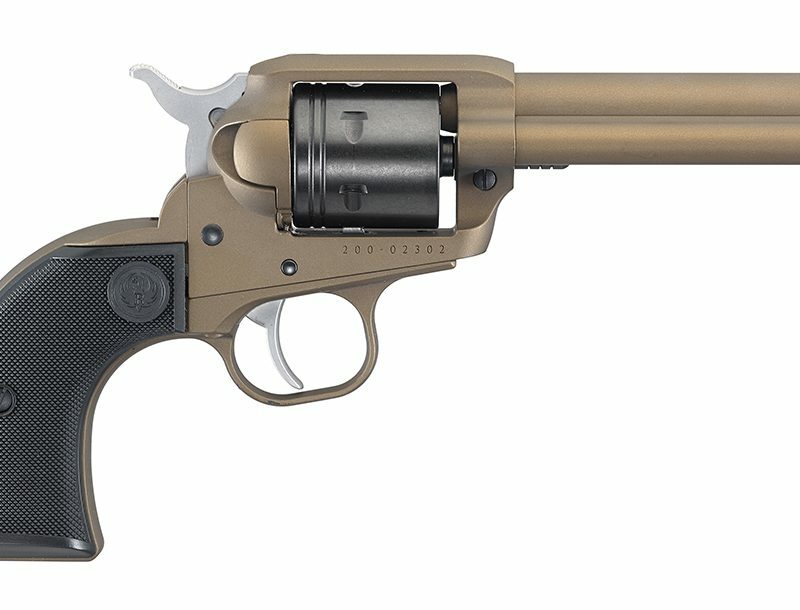 “We keep about 50 head of bison on hand at all times. Besides the small herd we have here in Warner, we also have small herds on land in Hillsborough, Henniker and Stoddard, New Hampshire,” noted Brian. The bison are allowed to grow naturally for 24 to 36 months, until they are the size that produces the best meat quality. All of the meat is processed under federal inspection, flash frozen and vacuum sealed. Yankee Farmer’s Market is unique in another way. In addition to selling bison products to markets and restaurants, it also sells live bison and gives help to people looking to start their own bison herds. It will even buy back the bison if the person realizes that raising bison is not for him. This is unheard of in many businesses. “We want to promote local farms and healthy living. By helping each other it only makes all of us better,” Brian said. Many farms in this country work hard to produce high-quality, healthy products. These are just two that are located in New Hampshire. In our modern world where faster and cheaper have become the norm, many have lost touch with what is truly important. 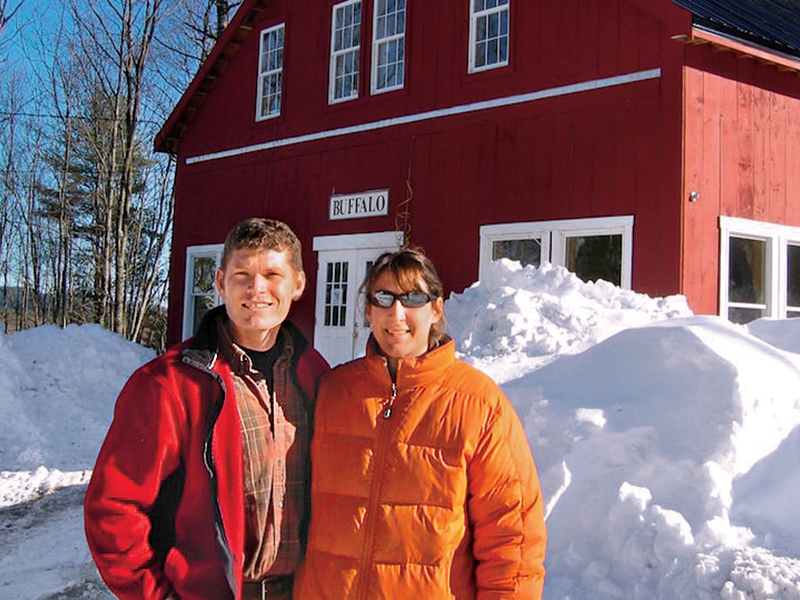 Both Wayne LeClair of Rocky Meadow Farm and Brian and Kiera Farmer of Yankee Farmer’s Market are true new pioneers. 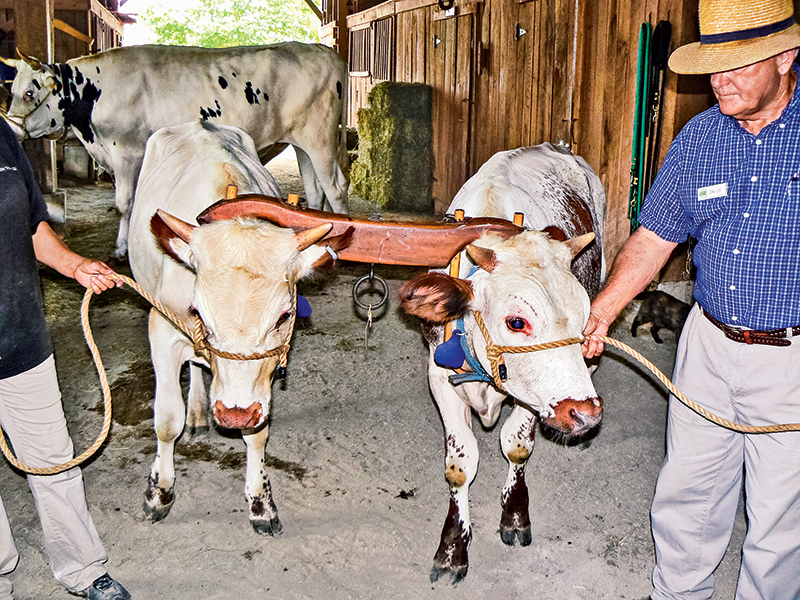 There are many heritage breeds of cattle, and there were cattle brought here by the Spanish, Dutch and others; however, there were three important ones brought or started here in North America at the time of colonization: the Canadienne Cow, the Milking Shorthorn and the Milking Devon. The Devon was first brought to the Plymouth Colony in 1623, making it the first import of British cattle to the U.S. 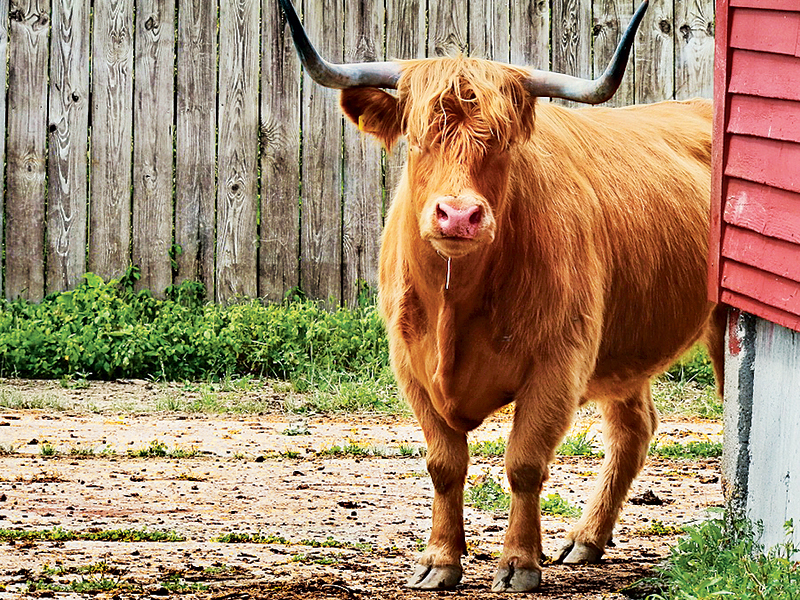 The Devon was highly valued for both its milk and meat, but it was as oxen that this breed really shined. These factors made this multi-purpose breed a mainstay of many small farms from New England to Virginia. The Milking Devon was developed in the United States and is a direct descendant of those original cattle brought from England in the 1600s. Today there are only around 500 registered Milking Devons left, and because of this and their multiple uses, these cattle are in high demand. The Milking Shorthorn is far more numerous than the Milking Devon, which it replaced on many farms. This breed was originally brought to Virginia from England in 1783. The United States continued to import this breed continuously during the early 1800s, and Shorthorns spread to New York, Kentucky and Ohio. Like the Devon, the breed is known for its milk production, meat and for being high-quality oxen. The cattle are very docile and their ability to adapt to roughage and less desirable grasses made them a top choice among colonial farmers. 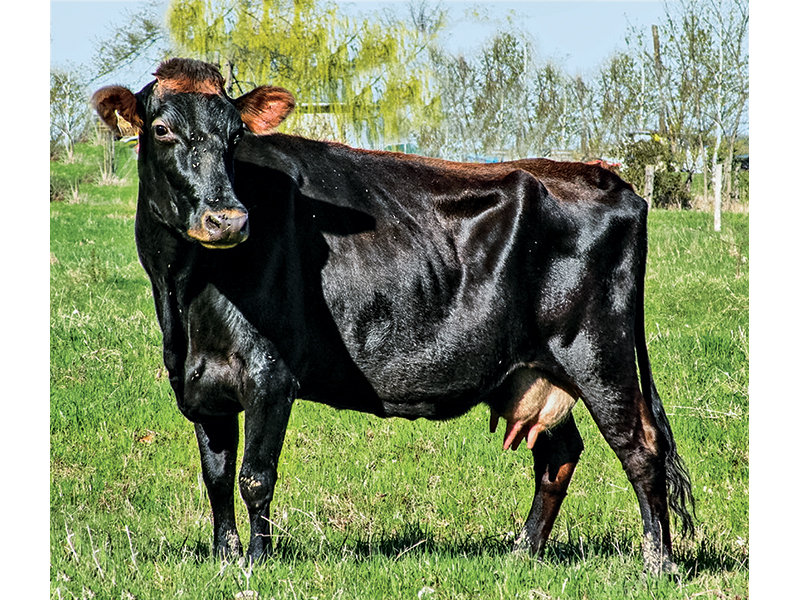 The Canadienne has the distinction of being the only dairy cow to be fully developed in North America. These cattle are direct descendants from French cattle that were brought to Quebec, Canada, in the early 1600s. 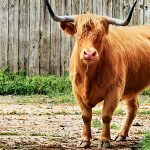 Unlike other breeds of cattle, the Canadienne is not the result of selective breeding, but rather has developed through natural selection. Not all cattle are suited to the climate of Quebec, but these cattle adapted because of their small stature, their ability to feed on less-than-desirable food and their ability to successfully breed in this harsh environment. This breed is seriously threatened since it has largely been replaced by the Brown Swiss, which produces a higher quantity of milk. Today there are only about 1,000 Canadienne cows left, with only 250 of them being considered full-blood.